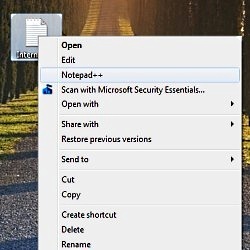 The big problem is that sometimes, your favorite program doesn’t come with a right-click context menu option. Or, maybe it does come with such an option, but it doesn’t work for some reason. Whatever the case, you can very quickly and easily add whatever program you want to the right-click menu in about 30 seconds. Now, you’re going to have edit the registry. If you’ve never done any registry edits before, don’t be afraid – it’s actually far less dangerous and far easier than you might think. That’s it! Note that if you are using a 32-bit version of Windows, the program path won’t have the ” (x86)” in there. You’ll have to get the full path to the program you want to add to the context menu. Also, don’t forget to add the space followed by %1 at the end. That %1 is the variable that Windows will use to pass the file name to be edited to the program of your choice. Now all that’s left is to test out your new right-click menu item. You should instantly see the new menu item. If you don’t, reboot and it will show up. You can add as many programs as you’d like to the right-click menu using this little trick. Just remember that if you uninstall the program, the context menu item will remain since you added it manually. To remove the menu item you just added, delete the 2 entries you made in Steps 1-9 above. Finally, note that there is no “Save” option in the Registry Editor. When you’re done making changes, just close the Registry Editor, and it’s saved. im having trouble with the first step lol. i have windows 7 but i dont have the search obox thingy. and i dont have a windows key lol. the search box is supposed to be right when you click start menu right? Yup. After clicking Start, there should be a box at the bottom of the Start Menu with the text “Search files and programs”. That’s where you type your search term or program to run. Could you add a detail on how to allow for a custom icon too?